Stumped for ideas on how to spend the last weekend of winter? We've got you covered! From Caribbean themed nights to Chinatown markets and even a vintage Fifties Fair, this weekend has something in store for all cultural enthusiasts. The crew at GoodGod Small Club just launched a new Thursday party night called "Full Up". The club has collaborated with the Jonkanoo Caribbean Canteen to give you a cultured Caribbean experience that you won't forget. Hosted by Sydney's legendary reggae entertainer, Mikey Glamour, the night is set to be a hit every Thursday, filled with typical Caribbean cuisine, beats and dancing. So why not kick-start the weekend a day early and head down to Chinatown to soak up the Jamaican riddims and embrace your inner Rasta. Fancy some all-you-can-eat hot dogs? Well head down to The Unicorn Hotel in Paddington from 8-10pm this Thursday and dig in! If that's not convincing enough why not sit back and enjoy a few beers before getting mid-week-wild to the sounds of some of Sydney's best DJs? Can't make it this week? Fret not, Cheval Noir is run every Thursday and has enough dogs to go around for everyone. It's time for "Little Hay Street" to turn into "Little Eat Street" once again this Friday. From 3pm – 11:30pm head down to Dixon Street Mall (in between Goulburn Street and Hay Street) for a mix of Asian cuisine and shopping. Whether you're looking for a place to grab a drink and a bite after work or simply want to experience the taste of Asia in Sydney, the Chinatown Night Markets have got you covered. Did someone say SALE? We all love a good sale and its even better when it's one of our favourite Aussie designers! The exclusive warehouse sale includes pieces from The Ringmaster, Zimmerman's 2014 Ready-to-Wear collection, and past season Swim and Resort collections. The sale will run from 9am-6pm this Friday and 9am-4pm Saturday. For more details, visit their Facebook page. After dropping her new EP "Calm Down", Alison Wonderland has announced an intimate club gig at Sydney's Metro Theatre this Saturday. If you're keen for some old-school hip hop mixes and new-school beats then this is the perfect way to spend your Saturday night. But be quick! Tickets are set to sell out fast as this will be the last Sydney headline show for some time. Head to the Metro Theatre website to purchase your tickets. Who doesn't love a good Op Shop? 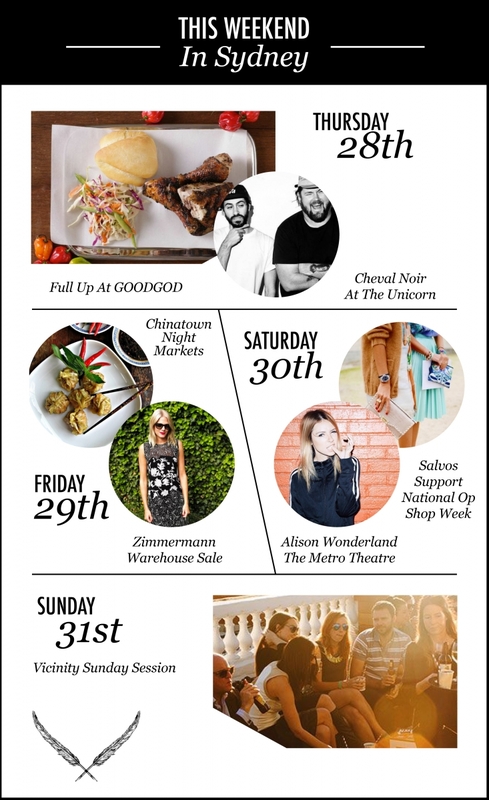 Well this week Salvos are bringing a shop opp to you! Salvos have partnered with NACRO (National Association of Charitable Recycling Organisations) to create their very own 'Pop Up Op Shop', a converted eco-friendly van that has been transformed into a funky fashion store – how cool! The van will be in Martin Place from 7:30am to 3:30pm for all lovers of everything vintage. They're even providing a free brekkie! And it's all for a great cause. For more info, head to their website. Vicinity Dining in Alexandria has begun holding live music sessions each Sunday. This Sunday, a bunch of local bands will be jamming out for your listening pleasure. Are you in a band or are a singer-songwriter? Just get in touch with Vicinity Dining and you can join in too! Free for musicians and attendees, this makes your Sunday afternoon fun AND easy on the wallet.